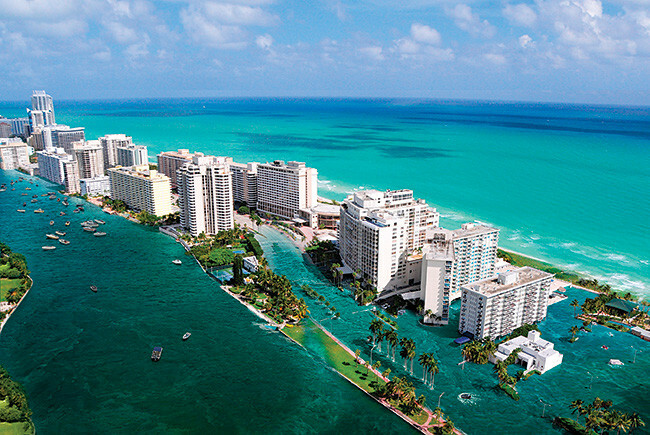 Florida Trend magazine/Joe Darrow illustration of how a rising sea level might change the face of Miami Beach. Florida Trend magazine just took an interesting look at climate change and what it might mean for the state of Florida. Their research suggests that millennials living in Florida could see a dramatically different landscape by the time they reach retirement. “Fort Lauderdale indeed becomes America’s Venice, with water at residential doorsteps,” says the magazine. US1 will be underwater, and Miami Beach will be partially submerged. You can read more about their predictions in the latest Florida Trend. P.S. Dire climate predictions aren’t driving away potential real estate investors, according to the magazine and a new Florida Realtors report. In 2017, Florida remained the top destination for foreign buyers purchasing U.S. residential real estate. They bought another $24 billion worth of Florida real estate so far this this year.